Want to know why? Download the guide and find out now. Execute a marketing plan to generate sales. Let’s be honest - putting effort into a marketing plan that isn’t generating results is frustrating. It’s a waste of time and money and a blow to morale. But being aware of the common causes for marketing failure can be exactly what you need to start generating success. You want a marketing plan that generates sales, and we want to help. 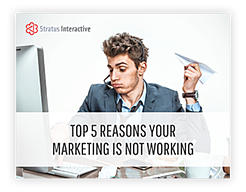 That’s why we’ve compiled the "Top 5 Reasons Your Marketing Is Not Working." Simply fill out the form to download your free copy.